Accompanied by a professional ORVIS endorsed guide. Located near Park City and Salt Lake City this Utah fly fishing lodge is easy to get to. Visit Falcon’s Ledge for a fly fishing vacation – fly fishing trip to remember. If you don’t know how to fly fish, we can teach you in one of our fly fishing schools. You can also enhance your next trip with a stop on the Weber or Provo River on your drive to or from the lodge. We can also arrange a day floating the famous Green River below Flaming Gorge dam. A single fly fishing trip can be filled with many different angling experiences. One day you might sight cast to big wary browns and rainbows on a clear cold tailwater or toss attractors to wild cutthroats and brookies in forested freestone streams above 8000 feet. The next day of your fly fishing vacation you might hit undercut banks with hoppers on private water at the Lake Fork River Ranch or cast to huge cruisers in our private stillwaters. With many stream and river fishing options within easy driving distance and access to sixteen trophy stillwaters you’ll never run out of things to try, or simply find your favorite and stick with it. 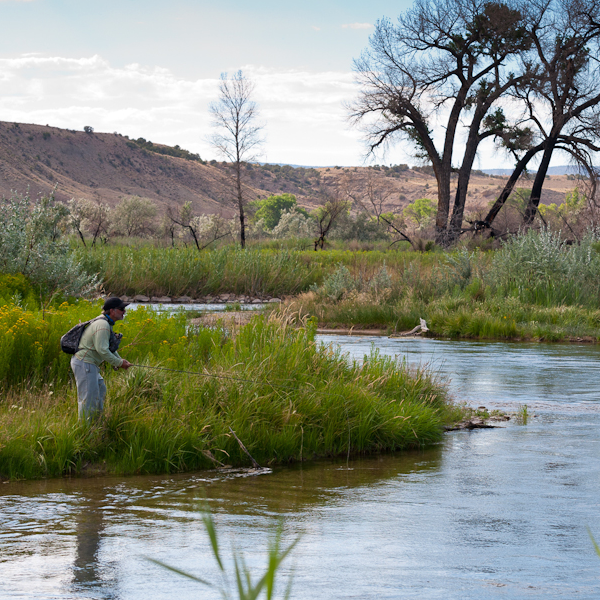 Whether you’re a beginning fly fisher, an expert, or somewhere in between, you’re sure to be provided an enjoyable Utah fly fishing experience. “Ours is the grandest sport. It is an intriguing battle of wits between an angler and a trout; and in addition to appreciating the tradition and grace of the game, we play it in the magnificent out-of-doors.” Ernest G. Schwiebert, Jr. This is your fly fishing vacation and we are here to assist you and make it enjoyable for you at your pace. Our guides are ORVIS® trained professionals who have decades of experience fishing the waters of Falcon’s Ledge. They have fished all over the west and fish year round. Let our guides show you the secrets of our rivers, streams and the unique character of each stillwater. They enjoy sharing their knowledge of the area’s history, geology, flora and fauna. Our guides are staunch stewards of nature, and active conservationists. Your guide will help you improve your casting and presentation skills, and help new anglers with knots, reading the water, stream entomology and how to match the hatch. All needed fly fishing equipment is included, including flies. We have the newest ORVIS® rods and reels for you to use. The great Utah fly fishing is only part of your adventure. You will stay in one of eight private guest rooms in the lodge. Each room has a private bath and reflects the comfortable elegance of Falcon’s Ledge. Three memorable meals are included with each day of fly fishing; our culinary staff prepares their legendary country gourmet fare from the freshest and highest quality ingredients available. After a day of fishing and a great meal, relax in the great room, TV room, or shoot pool in the game room. Sit out on the deck under the milky way and get ready for another great day of fishing. Wireless internet access can keep you connected to the real world if you must. Our Pro-Shop offers ORVIS® gear as well as fly tying tables to produce that special pattern your guide suggests, and a large selection of Falcon’s Ledge logo clothing and gifts. Spouses who are not fishing may accompany their fishing companions or pursue their own activities — the lodge includes a library of books and movies, a TV room, game room with card tables, ping pong table, pool table and board games. A large deck is available where you can relax and enjoy the view. Bring a camera and binoculars. Guests may hike and explore in several scenic directions from the lodge, including along the canyon rim. Bird watchers will enjoy the large variety of species seen in the canyon. Horseback riding at Hidden Springs Ranch can be arranged as well as several scenic drives in the surrounding area.